^ Honeywell, Inc. v. Sperry Rand Corp. , 180 U.S.P.Q. (BNA) 673, p. 20, finding 1.1.3 (U.S. District Court for the District of Minnesota, Fourth Division 1973) (“The ENIAC machine which embodied 'the invention' claimed by the ENIAC patent was in public use and non-experimental use for the following purposes, and at times prior to the critical date: ... Formal dedication use February 15, 1946 ...”). ^ a b c Wilkes, M. V. (1956). Automatic Digital Computers. New York: John Wiley & Sons. pp. 305 pages. QA76.W5 1956. ^ Farrington, Gregory. 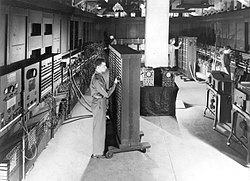 ENIAC: Birth of the Information Age. Popular Science. http://books.google.com/books?id=-TKv7UHgoTQC&pg=PA74&dq=ENIAC&hl=en&sa=X&ei=tUTqTuDgJeSZiQKZy4GwBA&ved=0CDgQ6AEwAA#v=onepage&q=ENIAC&f=false 2011年12月15日閲覧。. ^ もとの写真は次の雑誌記事にある。 Rose, Allen (April 1946). “Lightning Strikes Mathematics”. Popular Science: 83–86. http://books.google.com/books?id=niEDAAAAMBAJ&pg=PA83&dq=eniac+intitle:popular+intitle:science&hl=en&sa=X&ei=MnWLT_OVEuKciALYz5HzCw&ved=0CDsQ6AEwAA#v=onepage&q=eniac%20intitle%3Apopular%20intitle%3Ascience&f=false 2012年4月15日閲覧。. ^ Rojas, R. (1998). “How to make Zuse's Z3 a universal computer”. IEEE Annals of the History of Computing 20 (3): 51–54. doi:10.1109/85.707574. ^ B. Jack Copeland (editor), Colossus: The Secrets of Bletchley Park's Codebreaking Computers, 2006, Oxford University Press, ISBN 0-19-284055-X. Rojas, Raúl and Ulf Hashagen, editors, The First Computers: History and Architectures, 2000, MIT Press, ISBN 0-262-18197-5. Eames, Charles; Eames, Ray (1990-09-01). A Computer Perspective: Background to the Computer Age (New ed.). Harvard University Press. ISBN 0-674-15626-9. Mollenhoff, Clark R. (1988-04-30). Atanasoff: Forgotten Father of the Computer. Iowa State Univerity Press. ISBN 0-8138-0032-3. Dyson, George (2012). Turing's Cathedral: The Origins of the Digital Universe. New York: Pantheon Books. ISBN 978-0-375-42277-5. McCartney, Scott. 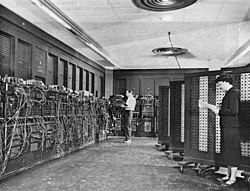 ENIAC: The Triumphs and Tragedies of the World's First Computer. Walker & Co, 1999. ISBN 0-8027-1348-3. Tompkins, C.B. and J.H Wakelin, High-Speed Computing Devices, McGraw-Hill, 1950.